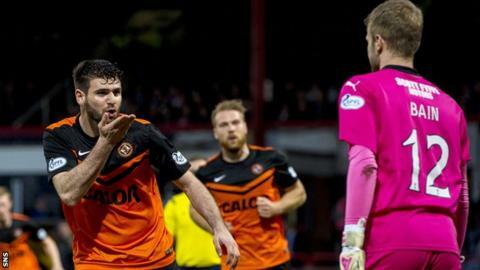 Dundee United have offered contract extensions to top scorer Nadir Ciftci and Scotland Under-19 defender John Souttar. Both have a year remaining on their existing deals and United say they are keen to retain their services. Media speculation has linked both with Celtic in recent weeks. "Both players have proved their worth to the team and the club as a whole and merit the extension offer," said a United spokesman. "We believe that Dundee United remains the best club for both players to develop and, as such, have made enhanced longer-term offers to the players that reflect their value to Dundee United." Ciftci joined United after leaving Dutch club Breda in 2013 and the 23-year-old Turk has scored 31 goals in 81 appearances. He represented Netherlands Under-17s and had a spell at Portsmouth as a teenager before moving to Kayserspor in his homeland and winning Turkey Under-19 caps. Souttar is a product of the United youth system and the 18-year-old has played 51 times for the Scottish Premiership club.